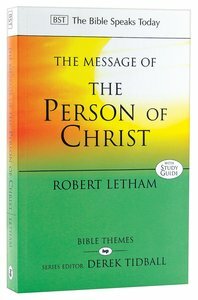 Robert Letham's purpose in this thematic study is to show how the whole of Scripture progressively reveals its central figure, Jesus Christ. With clarity and conviction, Letham expounds on a range of key texts from Genesis to Revelation, tracing the emergence of God's great plan. 272 pages, from IVP. About "Message of the Person of Christ, The: The Word Made Flesh (Bible Speaks Today Themes Series)"
Preaching's Preacher's Guide to the Best Bible Reference for 2014 (Theology) From the earliest pages of the Old Testament, the person of Jesus Christ is the key to the biblical story of God's unfolding plan to glorify himself in the salvation of the human race from sin, misery and death. As the plot gathers pace, the picture comes into greater focus, until eventually all points to one person. He is identified by angels, by John the Baptist, by the apostles and above all by his incarnation, life and works, crucifixion, resurrection and ascension. He is Jesus Christ, the Deliverer and Savior foretold and promised throughout. Robert Letham's purpose is to show how the Bible, progressively and in ever-greater detail, speaks to us of its central figure, Jesus Christ. With clarity and conviction, he expounds a range of key Old and New Testament texts from Genesis to Revelation and investigates the main scriptural themes, focusing on the narrative that traces the emergence of God's plan. In doing so, he stands with the Christian church down the ages in affirming that this is the key to understanding what the Bible, in its essential unity, is all about." Robert Letham (Ph.D., University of Aberdeen) is Lecturer in Systematic and Historical Theology at Wales Evangelical School of Theology. He has been in pastoral ministry for 25 years - and at Emmanuel Orthodox Presbyterian Church, Wilmington, Delaware since 1989. He has taught at London Bible College and is Adjunct Professor of Systematic Theology at Westminster Theological Seminary, Philadelphia and visiting Professor of Theology at Reformed Theological Seminary, Washington/Baltimore. Customer Reviews For "Message of the Person of Christ, The: The Word Made Flesh (Bible Speaks Today Themes Series)"
A serious book which takes you through the the Bible alone, to focus you on Christ alone. There is no frivolity but has an appropriate weightiness for a most important subject.It is also very inspiring as it leads you to think of all that it means for us to be "in Christ"
It should lead all to worship! In each of the 24 short chapters, Letham expounds a portion of Scripture illuminating on the person of Christ. He begins from the Old Testament promises, moving to Christ's incarnation, crucifixion, resurrection and ascension. This book is rich with theological insight yet has a personal warmth suitable for devotional reading. Highly recommended! With the eyes of a theologian and a cosmologist, David Wilkinson explores the message of creation in God's Word. Focusing on the beginning, the songs, the fulfilment, the lessons, and the Lord of creation, he brings the texts into lively conversation with contemporary concerns. Evil and suffering have always been part of human experience - and they present a significant challenge to Christian belief in a good and all-powerful God. Evil and suffering may be a mystery to us, but they are not a mystery to God. The Bible writers have no time for an unreal idealism, in which the life of faith is free from anguish, pain and perplexity. They are confident that God's power and wisdom are great enough not just to cope with the realities of suffering and evil, but to overcome and transform them, and to enable us to be 'more than conquerors' in a broken and hurting world. With warmth and clarity, Peter Hicks expounds a range of relevant biblical texts that enable us to set the issue of evil and suffering firmly in the context of the nature and purposes of God. Central to his approach is the conviction that the key lies in the cross and resurrection of Jesus Christ, the suffering and triumph of God himself. In valuable practical sections he explores the Bible's teaching on how we are to live in a world of evil and suffering. 288 pages from IVP.